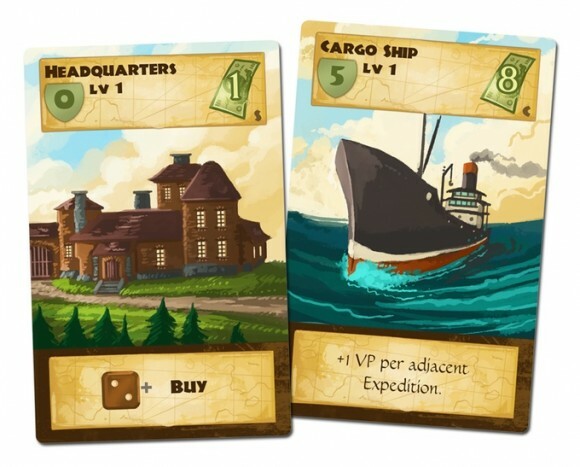 BoardGaming.com> Games> Dice Games> Artifacts, Inc.
Each player starts with a basic set of cards – some of these provide adventurers to send for artifacts, others – ways to obtain new artifacts, buy new buildings or sell existing items. There are also central cards – museums and traders that are available to all players. In order to use any given building a player must place one of their dice on the building’s action space. The trick is that different buildings have different prerequisites to dice that can be placed there. Some are fairly easy (a roll of 2 or higher), some can only be used with dice that rolled a high number. Sending your dice on expeditions yields artifacts that you can then sell (activating museum/trader buildings) for money. 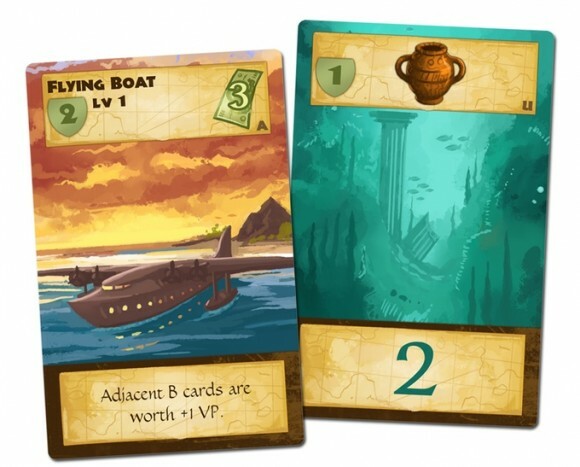 Money can in turn be used to buy more building cards, expanding your options, opening up more challenging and rewarding expeditions, giving you extra dice or allowing you to manipulate the rolls or score extra points based on card layout. Buying more buildings earns you “prestige points” that ultimately win you the game – the kicker is that museums (that you sell artifacts to) provide a significant bonus to your prestige at the very end of the game. This bonus is based on “selling record” of each player. This mechanic, along with a couple of alternative scoring options, adds a great twist to the end-game point calculation. Each player’s turns start with rolling all of their available dice and then assigning them to available buildings. The dice and the cards are all done in a fitting brown-hued faded style, fitting well into the theme. The little wooden cubes representing the artifacts that you collect represent a lost opportunity to breathe more life into the game – these are bland and, frustratingly, there is often an insufficient number of them to cover routine in-game situations. Since players go one at a time – down time can become an issue. It is less noticeable early in the game when the options are few, but as choices grow, so does the potential for analysis paralysis. The game plays 2-4, but the down time with maximum number of players is enough to significantly disengage those waiting, especially since there isn’t a lot to do during others’ turns. Three players seems to be the sweet spot as playing with two becomes a little too predictable and wait times in four player games are too long. The advertised playing time of an hour is about right. The game design pushes it to a pretty quick resolution once the economic engines the players build whir into motion. The experience playing it is certainly more of a quiet, thinky affair – those looking for interaction and sociability should look elsewhere. The random nature of dice means that at the beginning of every turn you have to figure out how to spend your available dice in the most efficient way to advance your agenda. This is a neat exercise – the card requirements are varied, so it doesn’t feel as if the game is entirely luck-driven. The success is figuring out what to do with what you have, not simply rolling high. There are some extreme cases where truly terrible rolling will lead to people not enjoying the game though. Every turn thus becomes a micro-puzzle and these are very enjoyable as you are collecting ancient scrolls and gems, selling these to museums and trying to place your buildings so that the adjacency bonuses score you extra points. There are multiple ways to acquire prestige and figuring out what makes most sense given your roll and your buildings is challenging but not overwhelming. The race to gain the museums’ favour provides pleasant (if limited) feeling of competition. The game is on the lighter side of medium in terms of complexity – there are a few things to remember but the logic of scoring points is very obvious and the potential appeal of Artifacts Inc. is limited more by its’ lack of interaction than its complexity. Artifacts, Inc. works best for 2-3 decisive players who want a smart experience that makes them adapt to ever-changing situations. Combined with an appealing design and a playing time that doesn’t drag out – it is a solid option especially if player interaction is not a high priority. A well-realized theme and excitement of dice rolls without completely being chance-driven round out the game’s appeal. I was a Kickstarter backer for Artifacts, Inc. and it has certainly left me with a feeling that I received a quality product – happy I could contribute to its’ success. It has found a valued spot in my collection. Add a Review for "Artifacts, Inc."